1. Vanity toll free numbers can boost your brand recognition and trust. Whether a prospect is calling your sales team to learn more about your services or an existing customer is calling for assistance, your business’s phone number is a major touchpoint people use to reach your company. Using a memorable vanity 800 number reinforces brand recognition and trust. Not only are vanity 1-800 telephone numbers easy to remember and recognize, they also give customers the confidence they are speaking to a trusted party. This is especially useful if your company calls customers or receives calls to collect payment. We live in the age of sneaky telemarking and fraud. When your company has a phone number and a website that customers recognize, it removes the fear of being scammed by a fraudster impersonating your business. One of the main reasons you should consider buying a vanity 800 number (for sale right here) for your business beyond brand marketing is building brand trust. When you call the number 1-800-XFINITY you know you are calling your cable company. When you call 1-800-FLOWERS you know who you are calling. 2. You should always buy (not rent) when it comes to vanity 800 numbers for sale. These are types of businesses are consider themselves to be marketing companies more so than phone companies. They own and lease great 1-800 vanity numbers to businesses across industries and have the ability to rent the same toll free numbers to multiple businesses based in different locations using something called geographic call forwarding. For example, these types of vanity number providers might rent the number 1-800-ROOFERS to a roofing company in New York and a roofing company in Chicago. When customers living in Chicago call that vanity toll free number they get routed to the Chicago-based roofer. Whereas customers living in New York would get the New York-based roofing company. 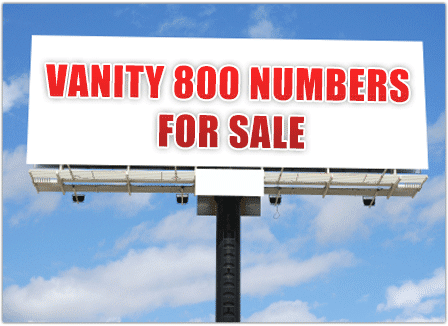 The pros of using a vanity number rental company are that they make it easy to set up and they have the best selection of vanity 800 numbers for sale. The cons are that it’s super expensive and you don’t own your vanity number. At any time you could lose your business number to a competitor down the street. These types of businesses also consider themselves to be more so marketing companies than phone companies because they sell vanity phone numbers outright and require you to transfer them to a phone service provider of your choice after you’ve made a purchase. The pros of using a vanity number vendor are that they typically have a good selection of vanity 1-800 numbers for sale and make it easy to initially reserve a number. However, the cons often out way they pros because vanity number vendors are essentially middlemen. Once you’ve bought a vanity number for a premium price, you have to transfer it to an actual phone company to use the number. And if it’s a toll free number you are required to transfer the number to a toll free service provider, you cannot just transfer the number to your cell phone company. This is the category that UniTel Voice falls into. These providers sell vanity 800 numbers and toll free number phone service so once you find the number you want, you can activate it and forward calls to any existing phone (landline, cell phone, smartphone, VoIP line etc.). The pros are affordability and business phone system features. The biggest con is potentially not finding the exact 800 number you want. However, if you can often find a great custom toll free number in available other toll free area codes. UniTel Voice allows you to forward your number to an existing line or use our built-in auto attendant, to greet and route calls to different department extensions or employee extensions. We offer a wide variety of vanity phone numbers with all the features of a professional virtual office phone system. 3. If the vanity 1-800 telephone number you want isn’t available, try an alternative toll free number prefix. Sometimes it’s hard to find good vanity numbers, especially true 1-800 numbers because they are only so many of these older toll free numbers available. The first toll free phone numbers with the area code 800, were released in the 1960s. Since then their popularity as business phone numbers has skyrocketed. The good news the FCC recognized the 800 number shortage and released toll free numbers in other prefixes including 888, 877, 866, 855, 844, 833 and the next scheduled to be release 822. So the moral of the story is if you can’t find a good vanity 800 phone number you should expand your search because there are many great vanity numbers available in other toll free prefixes.